Their Netflix interview marks an opportunity for both to set the tone for life after the biggest jobs either will ever have. Two months into his presidency, Barack Obama made history by becoming the nation's first sitting chief executive to visit "The Tonight Show," spurring then-host Jay Leno to thank him for "one of the best nights of my life." Obama would go on to become a frequent presence on comedy programs over the next eight years, from slow jamming the news with Jimmy Fallon to sitting between two ferns with Zach Galifianakis. But the 44th president seemed to enjoy both his easiest and sharpest rapport with Leno's longtime rival, David Letterman. The duo reunites Friday not at Starbucks, but with the premiere of "My Next Guest Needs No Introduction," Letterman's new six-installment, long-form talk show on Netflix. It marks Obama's first major post-presidency TV interview and Letterman's first major post-"Late Show" program. "My Next Guest" also offers opportunities for both men to set the tone and course for public life after the biggest jobs either will ever have. They're two very different men, coming off two very different gigs – both, though, with evolving rules for a post-peak future. The Obama's largely respected the custom of not knocking the sitting president, save for comments criticizing President Trump's immigration policies without naming him. Still, the youngest ex-president since Bill Clinton has kept a relatively low profile as he decides what to do after an eventful first 56 years of life. Letterman left his "Late Show" perch at age 68 – two years older than Johnny Carson was when he quit "The Tonight Show" and the public stage for good. But Letterman – like Leno – is determined to launch new ventures. In late 2016, Letterman hosted an installment of the National Geographic Channel’s "Years of Living Dangerously," ­traveling to India to report on climate change. The bearded late night guru appears driven these days by curiosity and trying to make sense of the world. That's a long way from the once-awkward interviewer who mocked guests from Madonna to Cher to Donald Trump, now the No. 1 target of comedians everywhere. Unlike Obama, Trump has avoided the late night TV game as president, regularly slamming the Hollywood and news media establishments he expertly exploited to forge his unlikely rise to power. Obama's choice of Letterman, rather than a journalist, for his first post-White House TV interview is almost Trump-like. It reflects his presidential approach of occasionally using late night comedy shows as a direct route to addressing the public – though not in the bombastic, near-daily fashion in which Trump employs Twitter. The former president also possesses an apparent affinity for Letterman whose NBC "Late Night" built a strong college following with its debut in 1982, when Obama was studying political science at Columbia University. “We’ve grown up with you,” he told Letterman in 2015. A clip released by Netflix Wednesday showed the ex-president and ex-“Late Show” host amiably chatting about the very grown-up subject of fatherhood. Obama tells Letterman and a studio audience about how he stuck to safe “dad moves” the time his daughter Sasha dragged him on stage to dance with Prince. 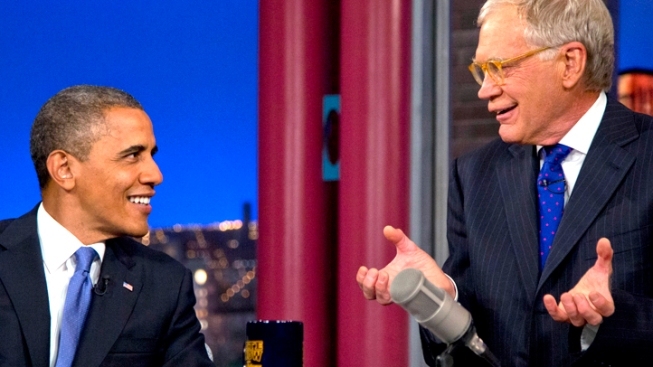 Obama and Letterman clearly have old stories to swap and new moves to bust out as each writes the next chapter in his public life.